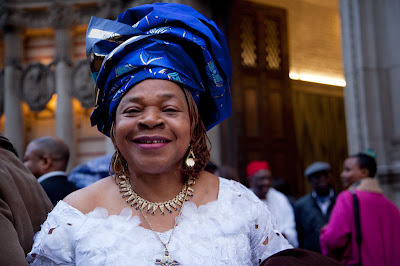 A colourful and glamorous service was held at Westminster Cathedral yesterday to celebrate Nigerian Independence Day. That's a great shot, Mo!! Great pic. But so sad that the news from Nigeria was so tragic. She looks fabulous and so happy. This image really tells the story - WOW! It is an image of someone who participates wholly in life...a royal queen, of course! Wonderfully expressive portrait. Excellent portrait Mo, not many that could carry off a 'chapeau' as big and colourful as this one. She looks fabulous. I bet this was a wonderful ceremony to see. This woman looks so happy in her brilliant costume. There are so many lovely traditional costumes all over Africa, they are always so colorful! She is a happy soul. A beautiful smile, love the hat. What a beautiful photo! I lived in Nigeria in the late 70s.